Synopsis: This study of the boundaries of personal property has an inward and an outward perspective, with the intellectual emphasis on the latter. The inward-looking inquiry considers shares as items of personal property. Nowadays those who think of themselves as shareholders often stand one step removed from the share itself. They hold what this book christens a sub-share. This part of the book asks in what sense shares and sub-shares can be conceived to be things, how those things are alienated, and how they are protected in litigation. The outward-looking inquiry then asks whether personal property can be contemplated as a sub-category of the law of things and, more particularly, as the law of all things locatable in space, alienable, or vindicable in court. The outward inquiry considers three boundaries. 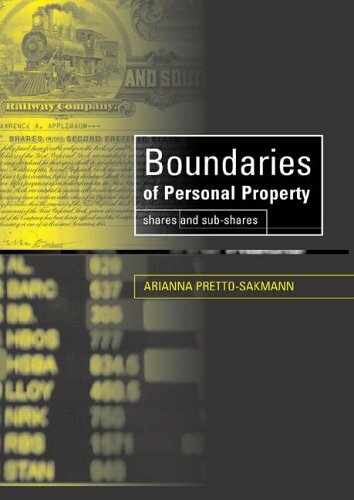 Within the law of property the line between realty and personalty proves relatively uncontroversial; the second boundary lies between property and obligations; the third between wealth and non-wealth. The second boundary is the main concern. Respect for it necessitates a differentiation between the law of property in the strict sense and the all-encompassing law of wealth, even where the consequence might be to exclude shares and sub-shares from the law of property. In maintaining the value of careful proprietary taxonomy and in reviving the underlying concepts on which it depends, this book opposes modern scepticism as to the possibility and desirability of precision in legal classification. In these commitments it could fairly be styled a post-modern study of personal property. Winner of the SLS Birks Prize for Outstanding Legal Scholarship 2006 - Second Prize.